This .8mm thick heavy duty easy wipe magnetic strip tape is perfect for racking and shelving labelling, supplied in 10m rolls and easy to cut to size. Simply write on with a wet wipe marker pen and wipe off with a damp cloth. 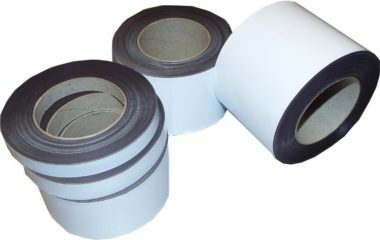 This tape is currently being offered at a special introductory price, you will pay the lower price indicated. This heavy duty easy wipe magnetic racking strip is sold in rolls of 10m and is suitable for use on most steel surfaces. The gloss surface enables the user to write on with a wet wipe marker pen and wipe off with a damp cloth. Using a wet wipe marker pen reduces the chances of the information being accidently wiped off.